Preheat oven to 400. 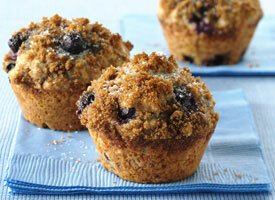 Spray 12 regular-size muffin cups with non stick spray, or use paper baking cups. In small bowl, stir together topping ingredients; set aside. In large bowl, beat soymilk, oil, agave and egg until well blended. Stir in flour and baking powder until dry ingredients are moistened (batter will be lumpy). Gently fold in blueberries. Divide batter evenly among muffin cups (cups will be full). Drizzle with Cinnamon Agave syrup. Bake 18 to 20 minutes until golden brown and toothpick inserted in center comes out clean. Immediately remove from pan. delicious muffins!! however, I couldn’t “sprinkle” the topping! Is there an error in the topping ingredients? 3 Tablespoons of Agave and 1/4 teaspoon of cinnamon created a syrup. It could not be sprinkled. Would love someone to tell me an alternative. Thank you. Hello and thank you so much for stopping by. You made the recipe exactly right. It was our error on the recipe it should have read “drizzle over muffins” not sprinkle. We do apologize for any confusion or misunderstanding. Thank you again for communicating as it will help all 32,000+ members benefit from the correction making it more clear. Please stop by again. Have a wonderful week. Wishing you great love, health and abundant happiness today and always!